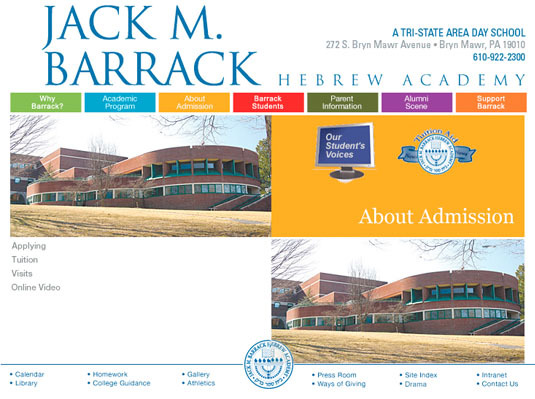 The Jack M. Barrack Hebrew Academy website homepage. 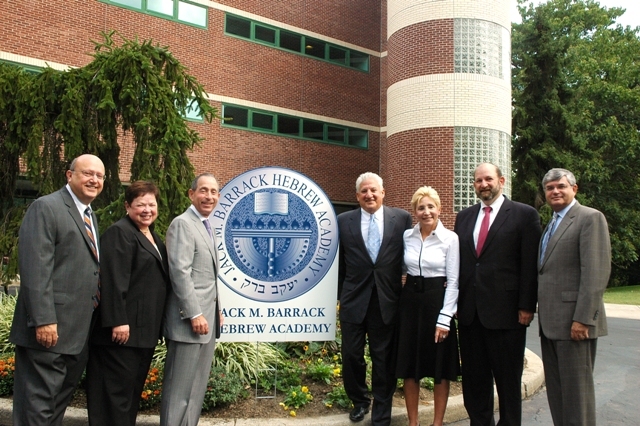 Jack M. Barrack Hebrew Academy was founded as Akiba Hebrew Academy in 1946. The school’s name was changed In September 2007 in memory the late brother of Leonard Barrack, an alumnus and school benefactor, Class of 1960, and now President of the Jewish Federation of Greater Philadelphia.. Originally, the school was housed at the YMHA at Broad and Pine Streets, but is now located in on a 35 acre arboretum campus (formerly the American College Campus) on Bryn Mawr Avenue. This site was purchased by the Jewish Federation of Greater Philadelphia in June 2007. A brand new, state-of-the-art building was designed and constructed on the campus for Barrack Hebrew Academy. The academy, which consists of a middle school, grades 6 through 8, and an upper school, grades 9 through 12, moved into the new facility in September 2008. Through collaborative and hands-on learning, Barrack students learn to think critically and creatively, problem solve, respect multiple points of view and develop a strong sense of identity and community. Our caring and experienced faculty motivates students to achieve their personal best, and our students live Jewish values every day. Barrack has a rigorous dual curriculum in academics and Jewish studies and offers students advanced placement classes and college preparatory programs. In addition, students learn Israeli history and culture, Jewish history and tradition and, importantly, they spend a trimester in Israel. Faculty members encourage lively discussions on Jewish culture and on Israel. Rabbi Michael Yondorff is a faculty member at Barrack Hebrew Academy who teaches various courses in Jewish studies. “Sometimes I teach a course in Bible, sometimes courses in Jewish Studies,” he said. “We discuss various topics like the holidays and the lifecycle, how to build community and community responsibility.” Students also study the Talmud. I spoke to Rabbi Yondorff about the faculty strike that took place in November 2009. He is active in the teachers’ union and told me that “the faculty has been organized in a union for a long time.” The recent dispute was over salaries, operating expenses and benefits. Yondorff summarized the background of the dispute for Philadelphia Jewish Voice. The Greater Philadelphia Jewish Community celebrated the renaming of Akiba Hebrew Academy, the nation's oldest pluralistic Jewish Day School as the Jack M. Barrack Hebrew Academy. Marking this milestone are (from left): Ira M. Schwartz, Federation president; his wife, Elaine (Newtown Square); Beryl D. Simonson, (Center City) immediate past chairman, Federation Board of Trustees; Leonard Barrack, chairman, Federation Board of Trustees and his wife, Lynne of Bryn Mawr; Jay Dorsch (Wynnewood), president of the Academy's Board of Directors and Rabbi Philip Field (Merion Station), Head of School. Still, the faculty did not go on strike right away. “At the beginning of the school year,” continued Yondorff, “we agreed to come back to work under the old contract while we continued to negotiate. There was an understanding that if either side felt that there was an impasse, two weeks’ notice would be given before either the union members would walk out, or [the administration] would lock us out.” At the end of October the union gave the administration the required two weeks notice and faculty members walked out. It was decided not to open school that Monday since the negotiations had not concluded until 4:00am, but the faculty did ratify the agreement that afternoon. School opened Tuesday morning. Everyone had one more thing to be grateful for on Thursday, Thanksgiving Day. Parents interested in sending their children to Barrack Academy can attend on of the open houses held on the first Tuesday of each month in the morning. For further information, contact the Academy at 272 South Bryn Mawr Avenue, Bryn Mawr, PA 19010, (610) 922-2300 or visit the website. To view previous editions of "Networking Central", please click here.